The 1994 Constitution of Argentina (as amended) does not refer to the rights to life or to freedom from torture, though it does cite the importance of both the 1966 Covenant on Civil and Political Rights (ICCPR) and the 1984 Convention against Torture (CAT).Art. 22, 1994 Constitution of Argentina. The Constitution also does not refer to the establishment of a national police service or regulate its power to use force. Police forces are organised on a federal and regional basis in Argentina. 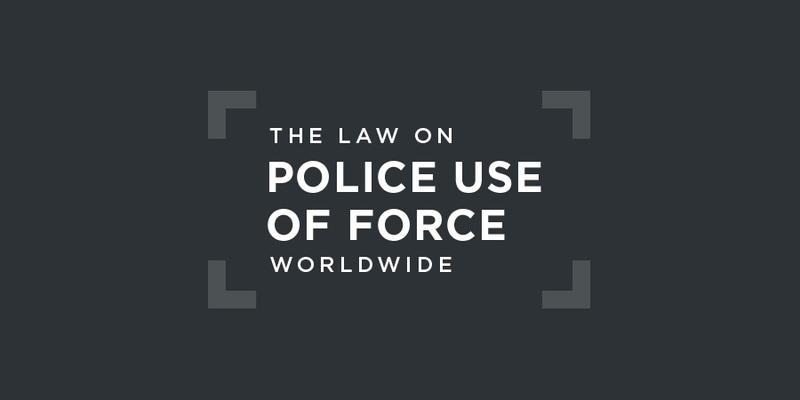 Lethal use of force by police is regulated by the 1984 Criminal Code (as amended). Under Articles 79 and 80, the crime of homicide is aggravated when it is committed by a member of the security forces (police or prison officer), in abuse of the function or position. Torture by a public servant is punishable by a term of imprisonment of eight to twenty-five years.Art. 144ter, 1984 Criminal Code (as amended).The 1979 United Nations Code of Conduct for Law Enforcement Officials was incorporated as an annex to the national Public Security Law (24059), which binds all of the provinces of the country. As a general rule, the use of firearms is not justified. Grounds for an exception to his rule are only given when ... the aggressor fires against police personnel and not to prevent his/her escape might imply a lethal threat for him- or herself or others. d) To prevent the escape of a person who represents that imminent threat and until he is arrested. c.3.- When making movements that indicate the imminent use of a weapon. d) When being armed, seek advantage by parading, hiding, or improving its attack position. In order to conform to international standards, it would be necessary to clarify that the threat of a minor bodily injury would not be sufficient to justify use of firearms. Under Law 5688, police action in the capital, Buenos Aires, is subject to additional constraints, including the principle of proportionality.Art. 83, Law 5688.The police are required to ensure the enjoyment of the right to life and bodily integrity of all demonstrators in the capital. Article 95 of the Law subjects the use of firearms to the United Nations Basic Principles on the Use of Force and Firearms by Law Enforcement Officials.Also restricted is the ability of members of the security forces who will be in direct contact with demonstrators to carry firearms.Art. 91, Law 5688. Allegations of criminal behaviour by police or prison officers are addressed by the General Prosecutor’s Office, which has an Office on Institutional Violence. The Defensor del Pueblo de la Nación Argentina (The Ombudsman of the Argentine State), established under Article 86 of the Constitution, is an independent institution dedicated to the defence of human rights that may investigate allegations of excessive or indiscriminate police use of force. about reported patterns of violence and arbitrary behaviour by the federal and provincial security forces in connection with police custody that takes place without a court order, particularly in cases involving socially marginalized young people and children, who are reportedly sometimes detained for identity checks or other reasons not linked to criminal conduct. According to information received, such abuses can include attempted murder....Committee against Torture, Concluding Observations on Argentina, 2017, para. 13. This recent case concerns the robbing and stabbing of a tourist by two criminals and the action of an off-duty police officer to shoot one of the two criminal suspects to prevent his escape. In February 2018, the officer was indicted for homicide by a Buenos Aires court as video evidence appeared to show the suspect running away and not, as Officer Chocobar had claimed, running towards him.